Many people find it hard differentiating between these two terms. They might seem to refer to the same qualities, but a deeper digging would reveal the differences better. Different characteristics differentiate the two. The definition of intelligence can be drawn from different perspectives. An online dictionary will define it as the ability to acquire knowledge and skills and using the two. It also refers to the intellectual or mental capacity of an individual on different grounds, rather than an individual area. 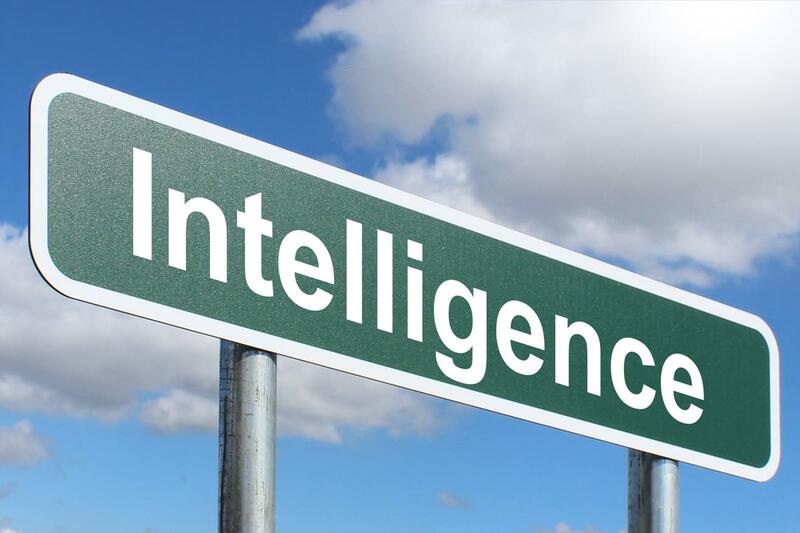 Intelligence also includes the capacity for understanding things, self-awareness, applying logic, emotional knowledge, learning, reasoning, problem-solving, creativity, and planning. You cannot acquire intelligence after sustained labor. It comes as a gift from nature. Also, it is not fixed to memory as an intelligent person may have a poor memory. Intelligence cannot be a skill which a staffer acquires after some practice. Knowledge can also draw its meaning from different lines. Many people have come up with its definitions but all point to the same thing. As an online dictionary will define it, it refers to information, facts, as well as skills that one acquires through either education or experience undertaking a certain task. It is basically the practical or theoretical understanding of a particular subject. Since it is an awareness or familiarity that one gains from experience, it is not inborn or naturally given. Knowledge depends and pertains to the circumstances that formed its existence around an idea, statement, or event. Therefore, it is contextual. It is only beneficial if applied. Its values may change over time. It is developed through a learning process. Depends on memory, expertise, exposure, past experiences, opportunities, and the transfer mechanisms. Knowledge is basically the acquisition and acceptance of facts while intelligence points out to the implementation of the facts wisely and perfectly. Knowledge can be the same in different individuals, especially if impacted under the same environment, for example, a classroom setup. Intelligence, on the other hand, is unique to individuals. The intelligence of two individuals with similar knowledge will create different results in real life situations. Knowledge acquisition is through experience, training, books, practice, materials, and research and is an ever-learning process. On the other hand, intelligence is inborn. It is in one’s genes, and the individual is naturally intelligent. Intelligence is all about doing the right things the right way without asking for guidance while knowledge needs one to acquire the skills to do something. The latter requires one to ask or learn anything to be able to do it. Knowledge helps one know of a problem or situation and how it came to happen. Intelligence, on the other hand, helps an individual to design ways to deal with that situation or solve the problem at hand. Knowledge is basically what people or someone already knows. They have been through the process of acquiring it and are passing it on to others. Intelligence is uniquely available to individuals. It helps with the proper implementation of the acquired knowledge. Knowledge is primarily a vehicle while intelligence is like the gas that drives it. Sarah Brown. "Difference Between Intelligence and Knowledge." DifferenceBetween.net. 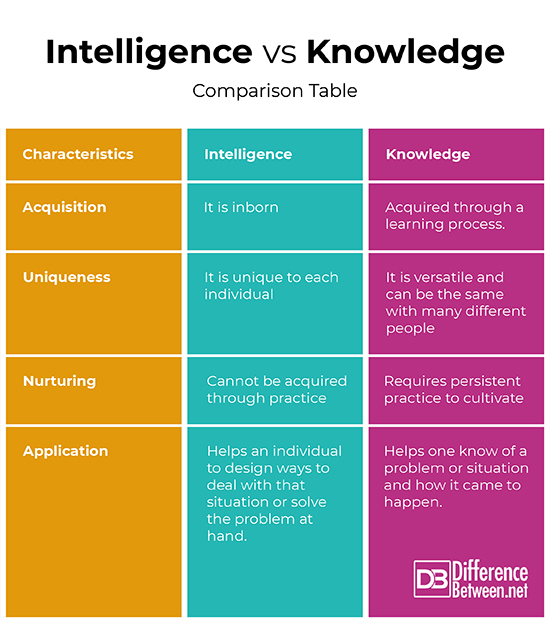 October 4, 2018 < http://www.differencebetween.net/language/difference-between-intelligence-and-knowledge/ >. Parankimalil, J. and →, V. (2018). Meaning, Nature and Characteristics of Intelligence. [online] John Parankimalil. Available at: https://johnparankimalil.wordpress.com/2014/11/17/meaning-nature-and-characteristics-of-intelligence/ [Accessed 20 Sep. 2018]. Tlu.ee. (2018). 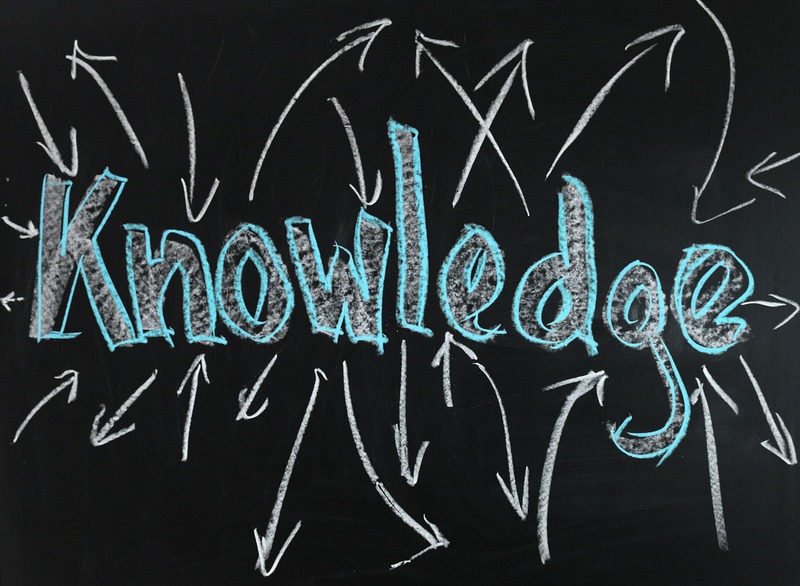 Characteristics of Knowledge | Key Concepts in Information and Knowledge Management. [online] Available at: https://www.tlu.ee/~sirvir/IKM/Key_Concepts_of_IKM/characteristics_of_knowledge.html [Accessed 20 Sep. 2018]. Kennon, J. (2018). Intelligence, Knowledge, Wisdom, Discernment, and Temperament. [online] Joshuakennon.com. Available at: https://www.joshuakennon.com/intelligence-knowledge-wisdom-discernment-temperament/ [Accessed 20 Sep. 2018].